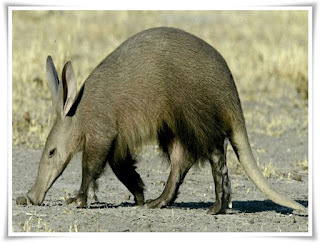 Aardvark (Orycteropus afer) is termite and ant eating animals that live in Africa, Aardvark have very sharp hearing so that he could hear the movement of insects that are under the ground. Aardvark also called ground pork. Ground pork name given by the Dutch people living in Africa. Aardvark or ground pork has a body size as large as the wild boar, but aardvark ear is bigger than the wild boar and a longer snout. Aardvark foraging by dismantling termite nests in Africa usually termite nests to make up ground. After successfully opening the termite nest, aardvark will immediately lick termites with long tongue and sticky. Adults aardvark have a long tongue which reached an average of 30 cm. His long tongue and sticky so perfect for infiltrating termite mounds and caves. Aardvark nails very strong and sharp, as she felt the danger of predators such as lions or tigers, he usually will be entered into the nest hole, or if he is away from the nest he will soon dig a hole and hide in the hole.